Richard Bland College of William & Mary and Navitas today announced the launch of a partnership to support the College’s internationalization goals. This linkage will grow and diversify the College’s international student population, broaden programming and services for international students, and enhance its global reach and reputation as an international study destination. Grounded in the liberal arts tradition of William & Mary, Richard Bland College (RBC) offers an innovative, two-year program that prepares students for university transfer. The partnership with Navitas will provide all of RBC’s international students with robust support services and customized programming to ensure their successful matriculation to one of RBC’s transfer partners, which include the College of William & Mary and the University of Virginia. As part of RBC’s broader internationalization strategy, Navitas will support the College’s efforts to expand and diversify its international student enrollment. Navitas’ global marketing and recruitment resources include 170 recruitment staff in 27 regional offices, managing relationships with 1000+ educational counsellors and providing access to prospective students in over 130 countries. Across its 32 university partnerships, Navitas recruited students from 161 countries for the 2016-17 academic year. 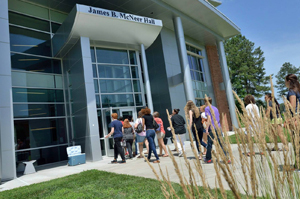 Richard Bland College is the first college in Virginia to partner with Navitas.